Less than 10 days remain to see the wonderful Verdura at 75 exhibit. I encourage any of you within the New York area to make time for this fabulous retrospective. And for those of you unable to visit, I hope to bring you a closer look at this special story very soon. While the house is certainly known for its more extravagant collections, many don’t realize that Verdura accessories are an accessible way to give or own a piece of the history, so on my most recent visit, I assembled a few chic holiday gift suggestions for any stylish man or woman on your list. It’s elevating the functional everyday accoutrements that can add a little beauty to our daily lives. 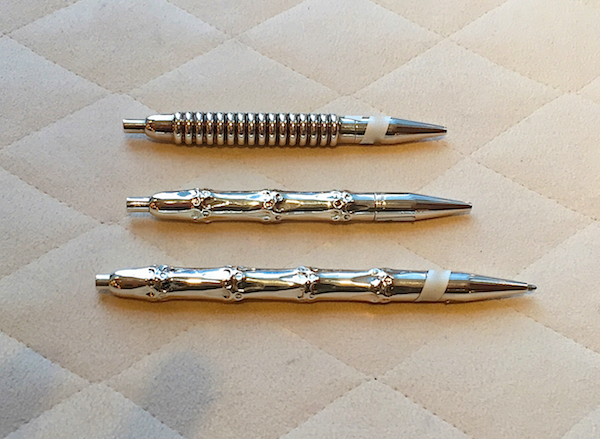 Who wouldn’t appreciate a beautiful silver pen for their purse, briefcase or desk? These charming ribbed and bamboo pens range from $225 to $250 – an affordable thoughtful gift for a special someone. So many of us live and breath our lives through our phones. But sometimes, a little analog beauty can be a welcome touch. 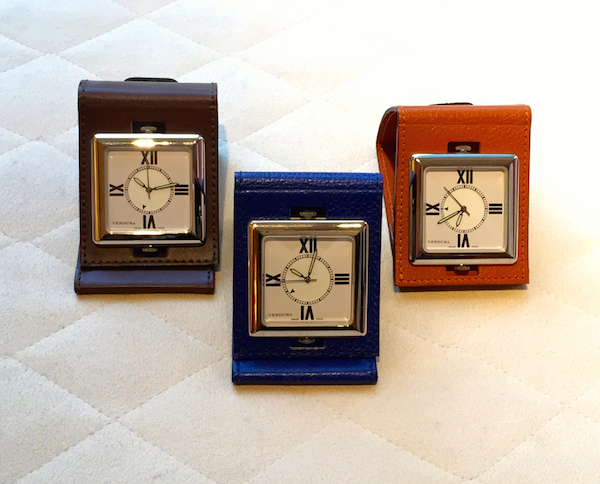 These leather folding travel alarm clocks have a spot for photo inserts and then neatly buckle up for a fashionable reminder of how long it will be be before the recipient sees you again! 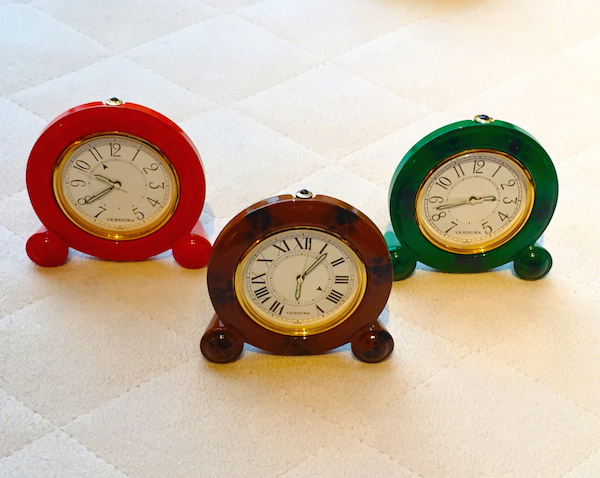 While wonderful for travel, these charming little alarm clocks are also perfect on a tight nightstand. Available in a wide array of jewel tones, these little gems add a little panache to your bedside vignette. The weave of his Panama hat, inspired Fulco di Verdura’s now iconic Criss Cross bracelet. And now the design enters the home arena with the handsome Criss Cross clocks. A new addition to Verdura’s accessories collection, they are a splurge for a hard working someone who deserves recognition. I am always searching for special additions to my holiday table and any of these would make the cut. 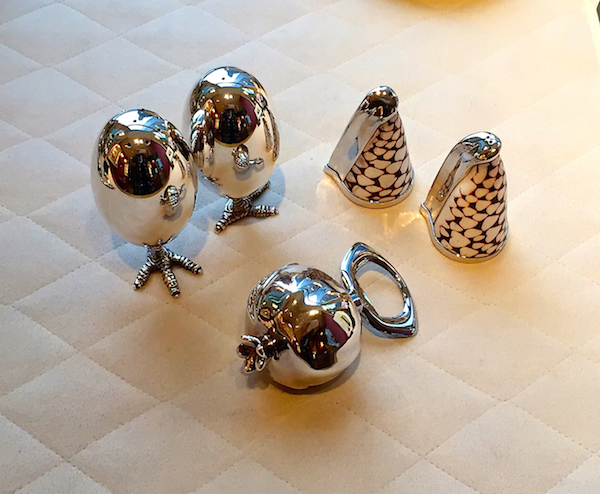 I am saving my pennies for the adorable sterling “Egg on Chicken Foot” or sterling marble cone shell salt and peppers. While they don’t necessarily fall into the readily affordable price range, their whimsical luxury reminds me of something I might have seen in the Bunny Mellon auction. The pomegranate bottle opener at $250 would be a wonderful house gift for a holiday guest and just might ensure another invitation. 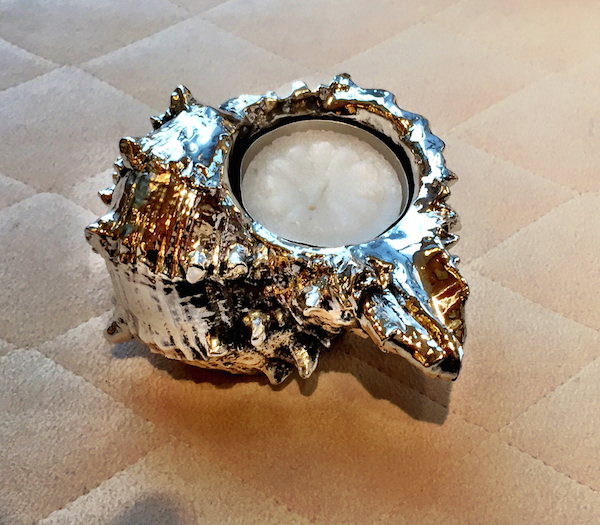 And imagine a dozen of these shell votive holders scattered across your table – for holiday or summer entertaining, these would add a significant sparkle of glamour. This entry posted in design, gifts, holiday, interior design, Uncategorized. 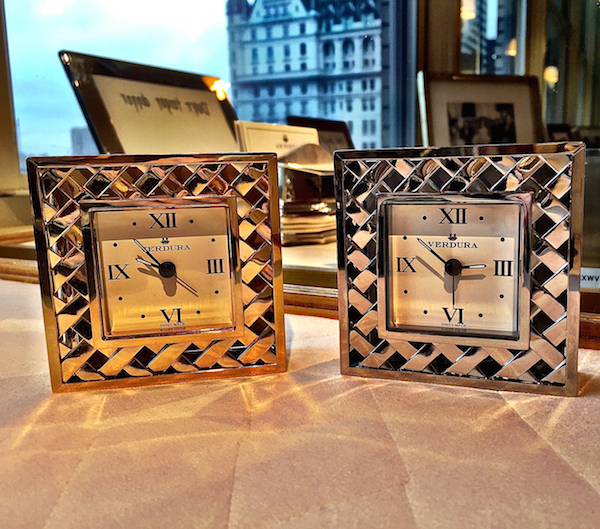 Entry Tags: glamorous gifts, Holiday shopping, travel clocks, Verdura Bookmark the permalink. The sterling eggs are fabulous! Thank you for the great information that you always supply your readers with ! I love that your Blog is a true Blog of design ideas, informative interviews with interesting people, and gives a snapshot into new ideas as well as trends. I have shared your Blog with many people! I have a good friend who has a very successful Event planning business and have forwarded her your post with the beautiful tablescapes! She is now a subscriber! I just wanted to give you a Bravo !! I hope your Holiday Season is a great one!! Stacey these are truly special, lovely gift ideas for that special person on your list! These are exquisite gifts indeed! I would be thrilled to give or receive any of them. The alarm clocks and pens in particular! Are they available on line or do you have to order them from the store directly? I did not see them on their web site. Hi Michael – the accessories are available for purchase in the store or by calling 212-758-3388. The small alarm clocks are $295. Happy holidays to you! I would like to purchase one of the small Bamboo pens for my wife please let me know how to do so. Thank you. The leather folding alarm clocks are the perfect gift, even if it’s for yourself. I would love to tuck one in a suitcase for trip. Invariably, the clock radio in the hotel is set for 4:00 am and I forgot to check before retiring. Best wishes for a wonderful Holiday season and a Merry Christmas! 84 queries in 0.425 seconds.